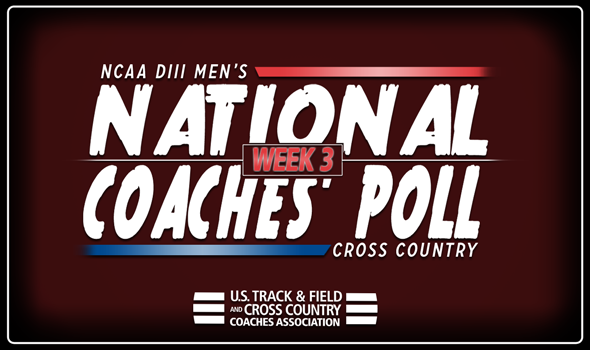 NEW ORLEANS – There might have only been one major meet in NCAA Division III Cross Country this past weekend, but what happened at the Purple Valley Classic really shook up the Men’s National Coaches’ Poll, which was released Wednesday by the U.S. Track & Field and Cross Country Coaches Association (USTFCCCA). Eleven teams that were in the top-15 of the Week 2 ballot swapped spots in Week 3 with two – Haverford and RPI – moving into a tie for third place behind perennially unanimous No. 1 North Central (Ill.) and No. 2 Washington (Mo.). RPI scorched a stacked field at the Purple Valley Classic this past weekend. The Engineers romped to a 31-point win over six other teams that were ranked in the Week 2 poll, including three others in the top-10. Sean O’Connor earned the individual victory for RPI and was named the National Athlete of the Week for his efforts. This is the highest ranking in program history for the Engineers, as they topped the previous high of No. 5 set in Week 1. Haverford, which didn’t race this past weekend, moved up one spot into a tie with RPI. The Fords are still riding high off their performance at the Main Line Invitational two weeks ago and are in the top-3 for the second year in a row. Haverford will return to action this weekend at the Paul Short Run in Bethlehem, Pennsylvania. Williams played host to the Purple Valley Classic and ran exceptionally well on their home course. The Ephs finished runner-up to the Engineers and jumped 11 spots in the National Coaches’ Poll to No. 6. This marks the seventh year in a row that Williams has been ranked in the top-10 at some point in the season. Johns Hopkins didn’t back down this past weekend at the Coast-to-Coast Battle in Beantown. The Blue Jays, competing as the only non-NCAA DI team in the championship race, finished 13th out of 23 teams. Johns Hopkins beat Providence, a team that had recently received votes in the NCAA DI National Coaches’ Poll. The Blue Jays were rewarded for their efforts as they flew from No. 16 to No. 9, their first time in the top-10 since Week 3 of 2017. Just two other programs jumped multiple spots in the positive direction: UW-Stevens Point (No. 31 to No. 27) and Dickinson (No. 35 to No. 32). The Pointers won the Brissman-Lundeen Invitational this past weekend with a total of 44 points as they put six runners in the top-16. The Red Devils cruised to a team title at their Long-Short Invitational this past weekend. Be sure to check back throughout the season as there will be more changes ahead of the 2018 NCAA Division III Cross Country Championships, set to take place Saturday, November 17 in Oshkosh, Wisconsin. What Makes The Roy Griak Invitational Special?